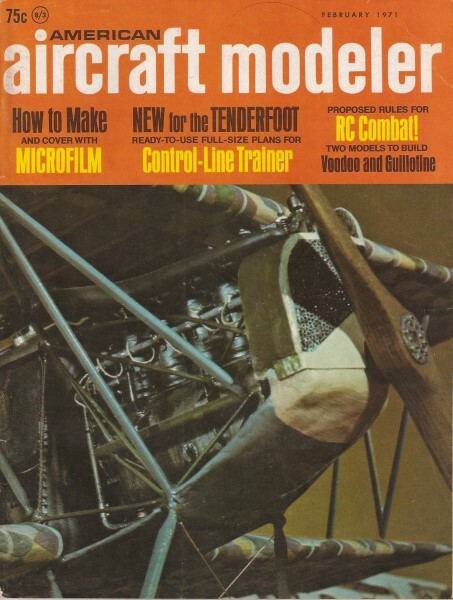 Occasionally, the Academy of Model Aeronautics (AMA) would publish a current list of chartered clubs in the American Aircraft Modeler magazine. Here is that list from the February 1971 edition. Check out some of the club logos - notice the vacuum tube in the Chicagoland RC Modelers logo? Was your club in existence then, or did you belong to one that no longer exists? Huachuca Modelers, Bill Weiss, 110 E. Meyer Ave., Ft.
Delaware RC Club, Morton Spielman 1600 Rodney Dr., West Chester, Pa.
See Maryland and Virginia listings. Bucaneer 'Flyers, Denice Haefner, 1841 Highland n-, Fernandina Ech. Golden Isles RC Club, Addison Clark 126 Arthur Moore Dr., St. Simons Isl. Northwest RC Club, David Heller, 835 N. Dunton Ave., Arlington Hts. Muncie Controliners, John McDonald Box 384. Daleville 47334. Hudson Valley RC. Inc., Fred Bange 64 Farm Rd., Briarcliff Manor, N.Y.
York Line Tamers, Richard Denveq 2560 Sunset Lane, York 17404 . Puget Sound Free Flighters, J. Chittenden 6101 Nyanza Pk., Dr., S.W.